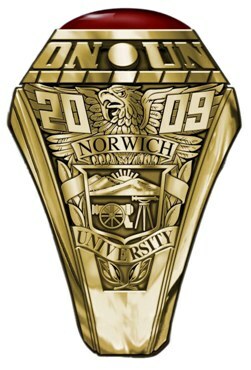 In early March of 1923, the Norwich Cadets decided to have a senior ring that would be distinctive of the University, and be handed down as a Norwich tradition. This ring would be a tradition that would forever connect all the cadets, both in the past and in the future. This tradition has continued for the Corps since 1923. Plans for the first civilian ring began in the Fall of 1989 with a meeting of the Board of Fellows and the Vermont College Student Government representatives. 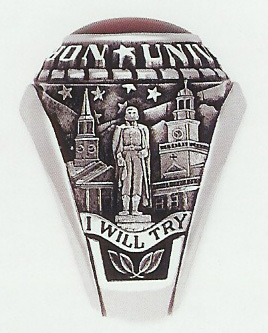 Approval was given to create a civilian class ring design that would be approved by the President, MG Russell Todd. The final approval had the school seal on one side and the student’s major on the other side. On the Bessel of the ring were two dates separating Norwich and University. The first date was 1819 for the date that Norwich University was founded. The second date was 1834 for the year that Newbury Seminary which became Vermont College. The first rings were distributed by the Bookstore and there was no Civilian Ring Dinner. In 1990, a ring tradition was started for the civilian population of Norwich University. Any civilian junior, senior or alumni who meet the criteria are eligible to wear the Norwich Ring. In 1995, with the approval of the President and the Trustees, a new crest and design were developed for our civilian students. It is hoped that this ring will bond the civilian students with the Institution and that the entire student body can carry on the Norwich Ring tradition. All will carry on the pride of wearing the Norwich Ring as a symbol of the their loyalty to the University and themselves. Surmounted on the Norwich shield, the eagle is symbolic of strength and courage in its depiction of both our school and our national symbol. The year date is the hallmark of our graduation year. Superimposed on the eagle, the proud name of our institution. Depicts a cannon and an engineer’s transit in the foreground of our nearby mountain ranges. The rays of the rising sun represent our beginning and hope of fulfillment. The cannon represents the military heritage of the institution; the engineers transit represents our academic mission. The founding father of Norwich University whose values and visions still hold true today. Regardless of the lifestyle chosen, Norwich offers the opportunity for achievement in the Alden Partridge tradition. A permanent landmark that oversees Norwich every day. It is a symbol of our strength and commitment to Norwich University. White Chapel/Jackman Hall: The permanent structures that we pass everyday, again representing the tradition and beauty of Norwich University. The motto of Norwich, it conveys the lasting spirit of the University.